This article first appeared on East Niagara Post on June 2, 2015. It is repeated here as I work to put all my book reviews in one place. They will be posted on Thursdays or Fridays and only be altered from the original in that I will add publisher information and pages. Hopefully, by revisiting these reviews, other people might find a book they'd like to pick up for their own enjoyment. If you’re into classic spy novels where there’s more thinking involved than gratuitous violence, this week’s book might just be for you. 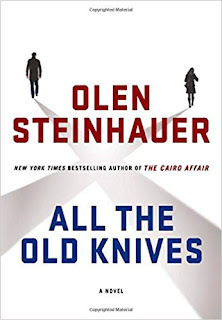 With All the Old Knives by Olen Steinhauer, you’re given exactly that. This subtle thriller will keep you guessing until the end, and even beyond. Henry Pelham is an officer in the CIA, stationed in Vienna. Several years before, terrorists hijacked a plane taking more than one hundred hostages, including a CIA officer. A rescue attempts goes horribly wrong and both the terrorists and hostages die. Now, several years later, an investigation is launched to determine whether the agent was simply compromised or whether the hijackers had a mole inside the agency. Pelham is sent back to the United States on a round of interviews with other officers from the Vienna station on that fateful day. Next on his list is former girlfriend, Celia Harrison. After her abrupt departure from his Vienna apartment, Celia moved back to the States, married, and had a couple children. The visit will be Pelham’s first interaction with the woman he thought he was going to marry since that morning in Vienna several years before. The narrative flips back and forth between Henry and Celia. Flashbacks of the same events from each point of view describes the interaction between the terrorists and the world, the terrorists and the CIA officers, as well as the relationships between the various officers themselves. The individual perceptions of the events leading up to and after the tragedy create a vivid and fuller history. Sitting down with Celia, Henry is wracked with nostalgia over his lost love. Memories from that day come fast and furious for both of them as they talk over dinner. Who is the mole? Henry believes it could be Celia, especially after her abrupt departure and retirement. Celia has been out of the game for several years, but still has the skills to hide her own suspicions from Henry. 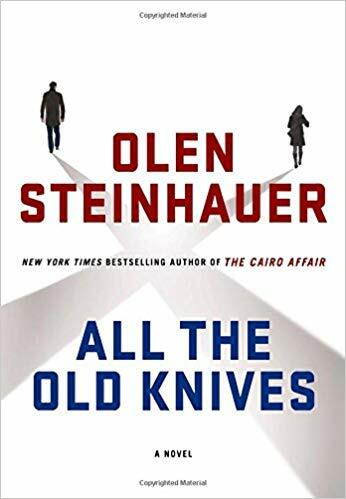 All the Old Knives is a thriller in the cerebral sense of the word. As you’re reading this novel, your mind is racing back and forth between countless possibilities. Just when you think you have it all figured out, a new twist pops in and bursts that bubble of certainty. Just before you read the last sentence of the last last paragraph of the last page, you think you know exactly how it has all turned out. And then the book is over and you’re not so sure anymore. Olen Steinhauer gives Henry and Celia very different voices when he switches points of view. It’s hard to tell which, if either, of the characters is lying. They both wholeheartedly believe in their own memories. As a reader, you will find it difficult to believe one over the other. Just like a good spy, both characters hide their true intentions beneath layers of half-truths and lies. Steinhauer does an impeccable job with his narrative. It engages the reader as you attempt to strip away those layers to discover the truth for yourself. I really enjoyed this spy thriller, even if it wasn’t filled with car chases, kidnappings, or shootouts. I always like books that keep you guessing until the very end. This one keeps you thinking even after you’ve closed the book on its last page. It’s worth taking the time to grab it from the library and sitting out in the backyard with a cold beer and a good book. Craig Bacon will be out in the backyard all summer with a cold beer or two, even if he doesn’t have the next great spy novel in this hands. But he probably will. Enjoy his half-truths and subterfuge on Twitter at @craigbacon1973.